The Burnley team operated from Towneley Stadium on the Todmorden Road in Lancashire. They held their inaugural meeting on 30th March 1929 on the dirt track surface. As is customary at these speedway venues, there was also greyhound racing at the track, with the first meeting taking place as early as 3rd September 1927. The final greyhound meeting took place in 1933. 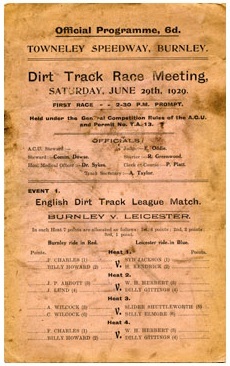 The team entered the English Dirt Track league in 1929 and managed to beat Salford 41-22 in their first League match. At one of their final meetings on 29th June 1929 against Leicester they held just 4 races before the meeting had to be abandoned because of excessive dust.